Search and view data from the past 120 years. Contains an array of valuable content from a unique angle as an English-language newspaper in Japan. Encompasses articles, photos and advertisements, which can be used for PR material. 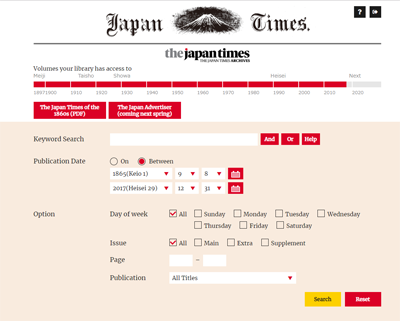 The Japan Times Archives enables users to easily search for articles on about 500,000 pages across 120 years, ranging from the inaugural issue in March 1897 to December 2017. 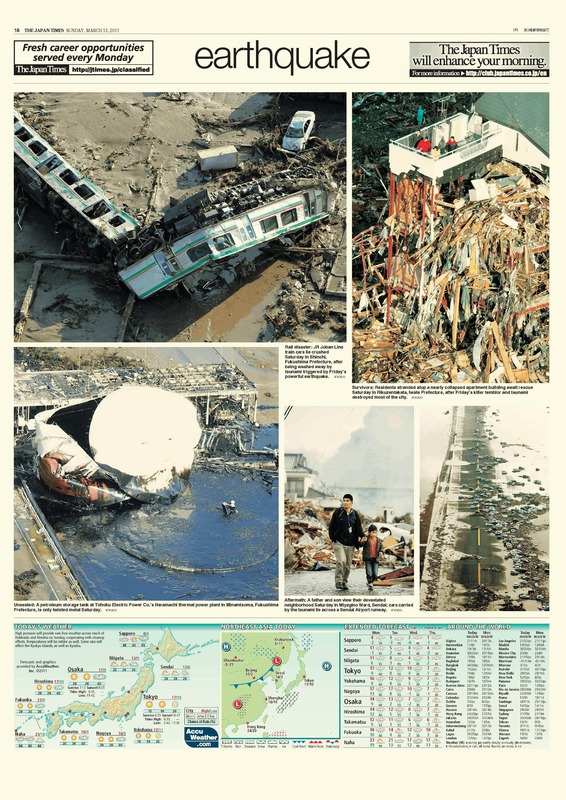 The Japan Times continues to report with perspectives absent from Japanese-language papers, as well as clear, contextual explanations for non-Japanese readers. The database offers valuable historical content covering domestic and international politics, economy, culture, TV schedules, advertisements, weather forecasts and other useful topics. 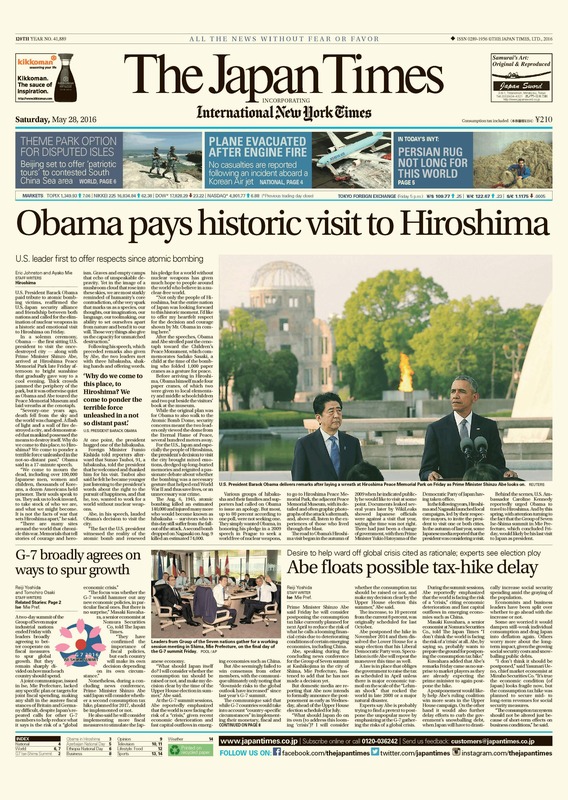 The Japan Times Archives is used in universities, schools, libraries and research institutes in Japan and abroad. We also sell archive content to companies and organizations. Our content is an impactful addition to any PR materials and events celebrating your organizations'anniversaries. We are also able to provide proposals for packages on international PR strategies. IN ITS 120 YEARS OF HISTORY. 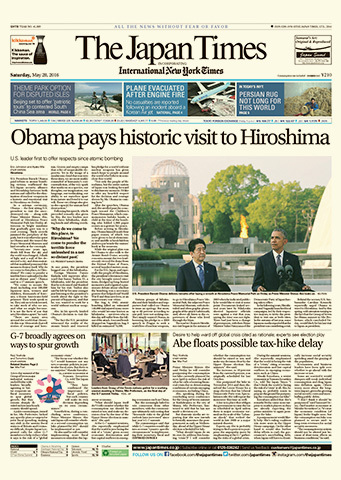 The Japan Times Archives is a database spanning the newspaper's inaugural issue in 1897 to the present. It enables users to search for and read individual pages of every issue published throughout those 120 years. 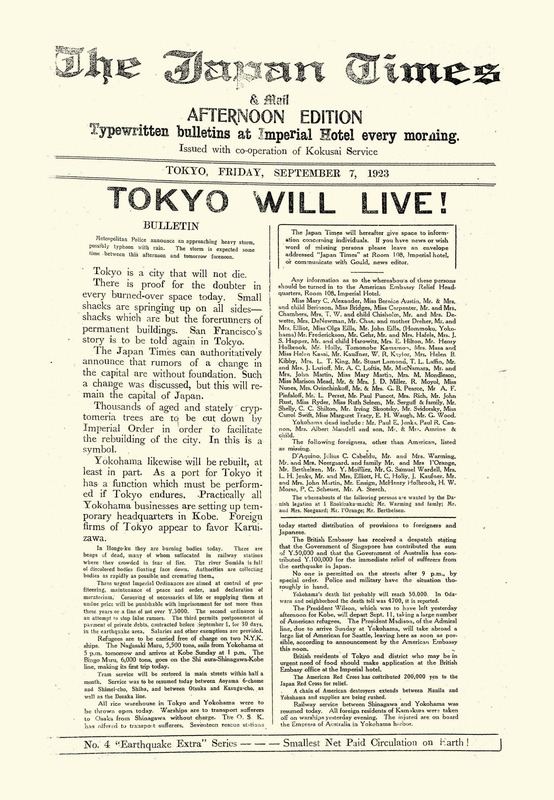 With support from former Prime Minister Hirobumi Ito and Keio University founder Yukichi Fukuzawa, The Japan Times was launched on March 22, 1897 as the first English-language newspaper published by a Japanese company. 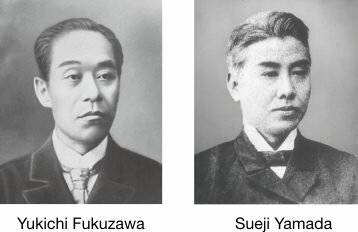 Sueji Yamada, a relative of Fukuzawa, was the newspaper's founding president and the editor in chief was Motosada Zumoto, a student of Fukuzawa’s, who was reputed to be Japan’s best English writer at the time. 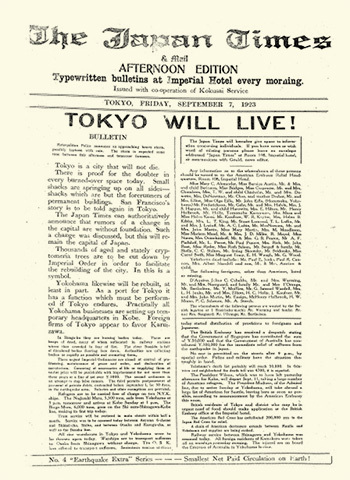 About 30 years prior, there was another English-language newspaper published by British residents in Yokohama that was also called The Japan Times, but it merged with The Japan Mail in 1870 - an entity the new Japan Times would acquire in 1918. 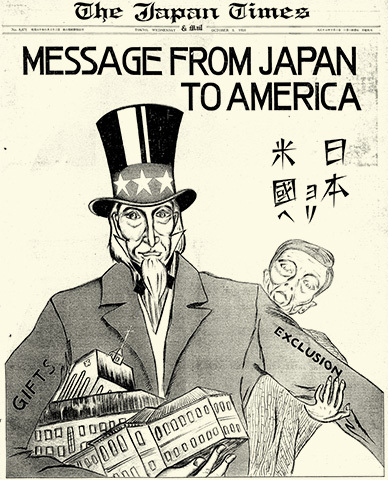 The Japan Times later acquired The Japan Chronicle (formerly British-owned) and The Japan Advertiser (initially American-owned) in 1940, establishing its role as a prominent publication. We are currently working on making content published from the end of the Edo Period to the beginning of the Meiji Era (roughly 150 years ago) available, as well as material from The Japan Advertiser when Jiro Shirasu was a reporter. Do not miss this opportunity to explore the database of the largest English-language newspaper in Japan. 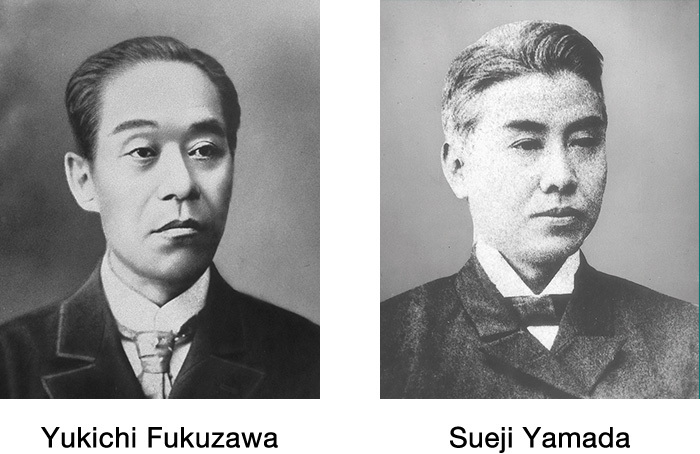 The Japan Times, with the aim of becoming a bridge between the Japanese and the foreign community, was first launched by Keio University founder Yukichi Fukuzawa's relative, Sueji Yamada and Motosada Zumoto, a secretary to Prime Minister Hirobumi Ito. 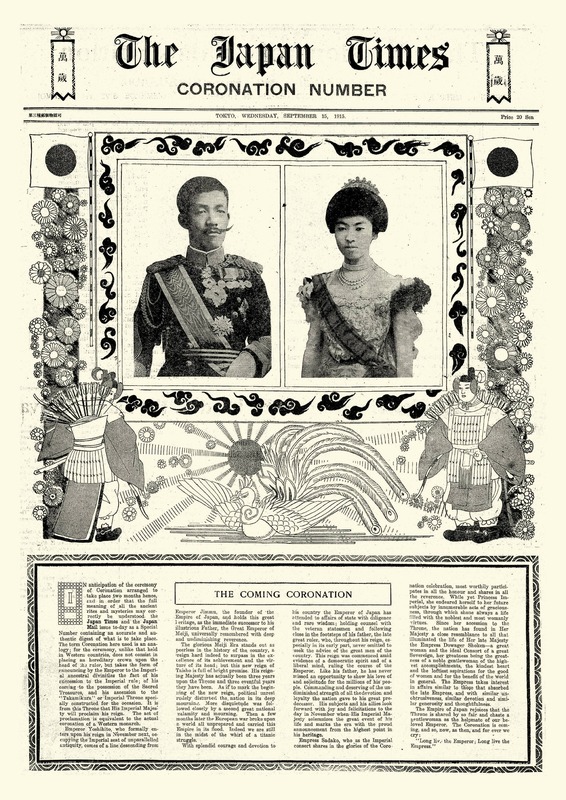 Early in the Showa Era, the newspaper worked for the restoration of good relations with the various foreign countries. This mission to deepen the mutual understanding between Japan and other countries emanates from its pages. This looks at the differences in methods of ascension between Japan and the West, their royal households and enthronement. 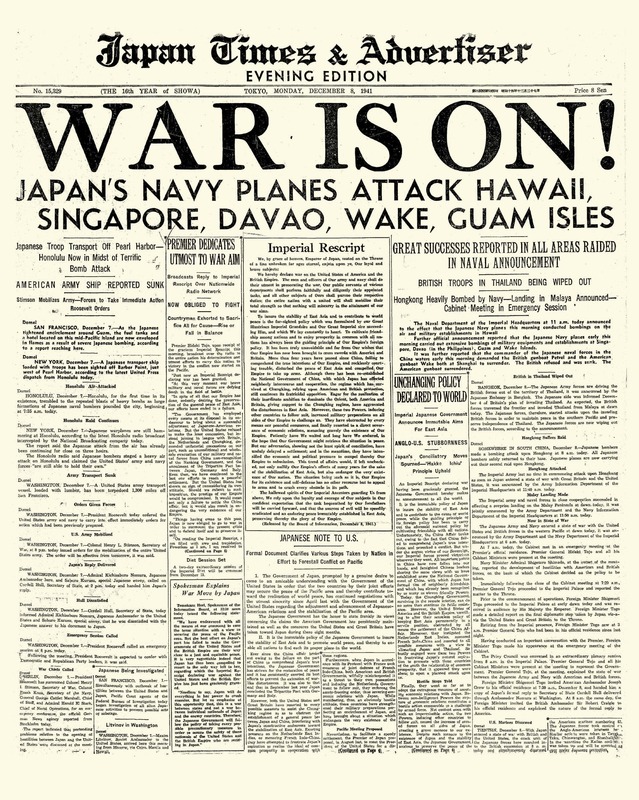 During World War II, as The Japan Times reported on the unfolding events under strict censorship, it was hard to detect from daily headlines that Japan was losing the war. 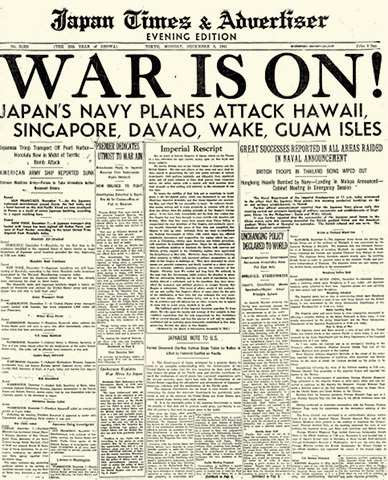 Under pressure from the military, the newspaper's name was changed to The Nippon Times on Jan. 1, 1941. To capture the major significance of this event in a proper headline typeface, the JT editor-in-charge at the time resorted to a wooden typeface used for advertising. This typeface, which only had 1 block per character and, as such, letters could not be used twice, resulted in this historic headline. In 1952, Japan regained sovereignty, and in 1956, the paper's name reverted back to The Japan Times. 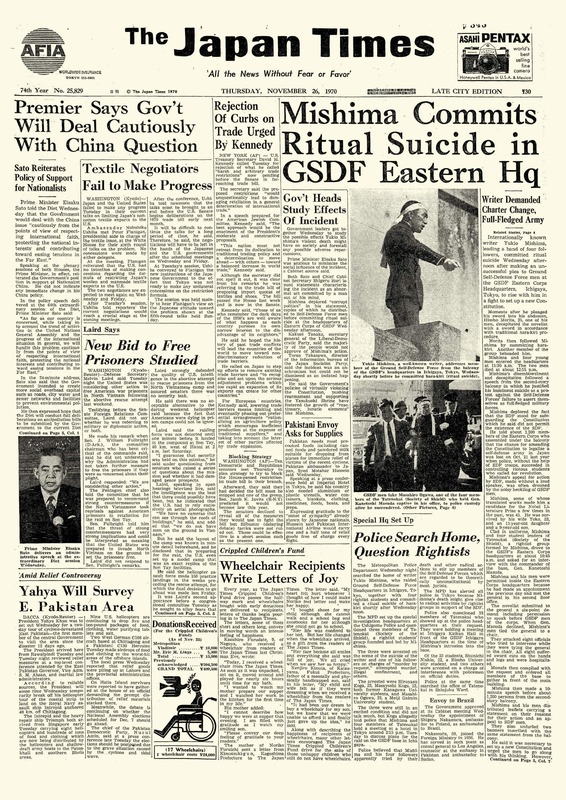 In times of accelerated economic growth, the paper's pages during the 1960s carried a large amount of economy-related content. Today, The Japan Times is not only delivered as a printed newspaper, but also in real-time via our website and numerous social media channels. Yukio Mishima, an internationally renowned author, called on 1,000 members of the SDF to join him in an uprising to revise the Japanese constitution. 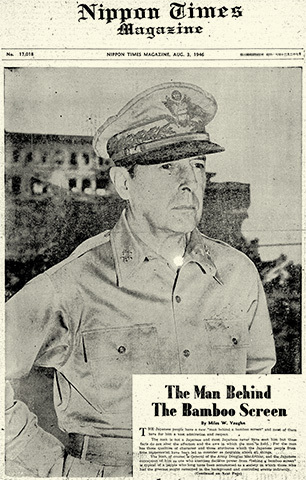 Failing in his mission, he shocked the nation by committing suicide on the roof of the Eastern headquarters of the Self-Defense Forces. Barack Obama made history as the first sitting American president to visit Hiroshima. The Japan Times has presented a wide range of Japanese culture-related special features covering areas such as contemporary Japanese film and music, as well as more traditional aspects of Japanese culture, such as kabuki, ukiyo-e and the tea ceremony. 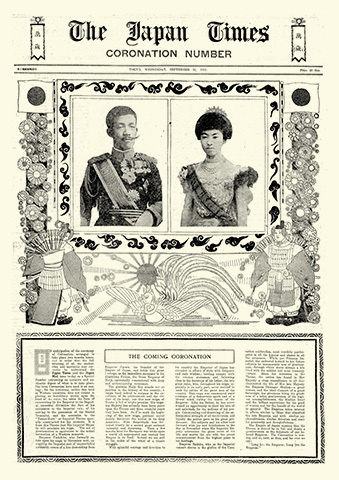 Although in its early days, The Japan Times was often introducing local culture to foreign readers for the first time, more recently, its features acknowledge a familiarity with Japan's customs and arts. Ryuichi Sakamoto and Perfume are among the globally recognized trail-blazers that The Japan Times has interviewed. 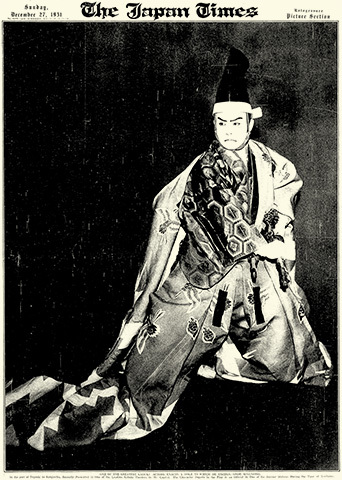 In a special photo issue published in December 1931, a full-page photo is carried of the kabuki actor, the Onoe Kikugoro VI. 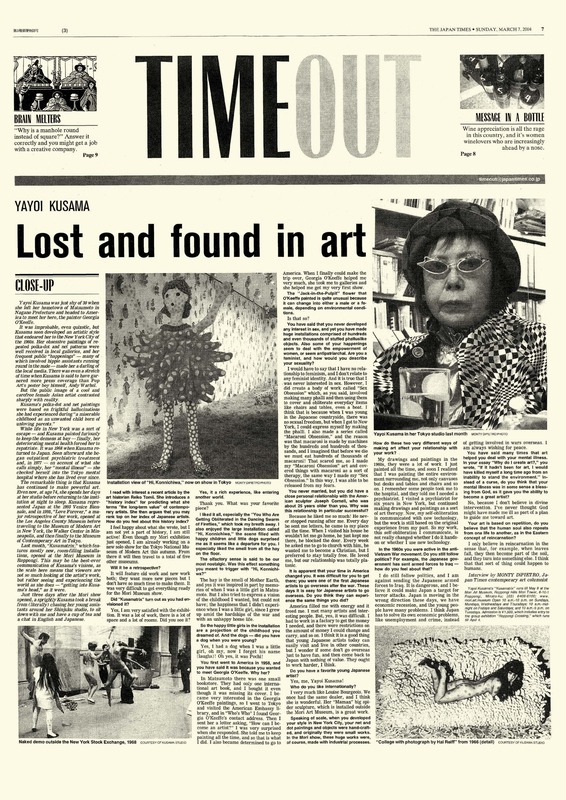 Many now-famous Japanese artists have gained recognition in Japan after attracting overseas attention. 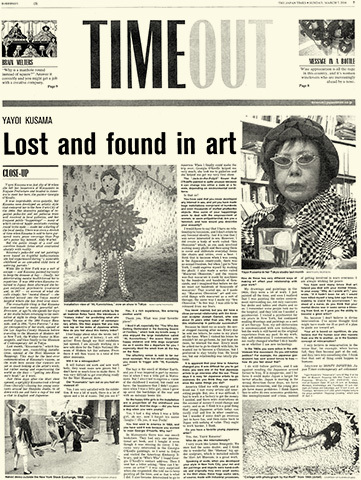 Yayoi Kusama is one such artist. 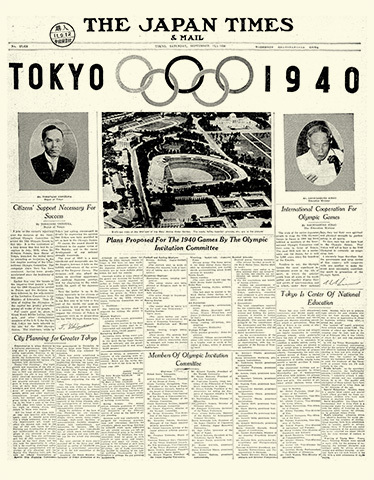 The 1940 Summer Olympics were originally scheduled to be held in Tokyo, but they were canceled after the outbreak of the Sino-Japanese war. 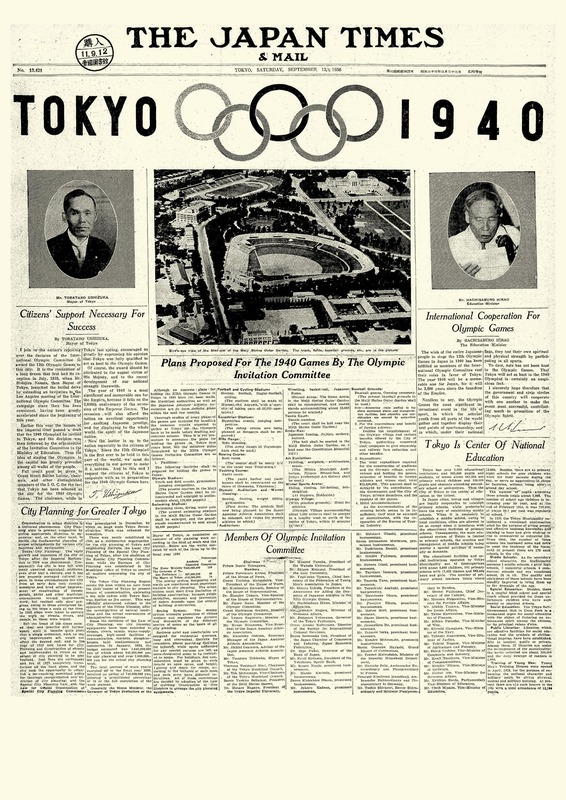 It would not be until 24 years later that the Olympics were held in Tokyo. It had been known that the first English translations of Eiji Yoshikawa's work appeared in 1956. 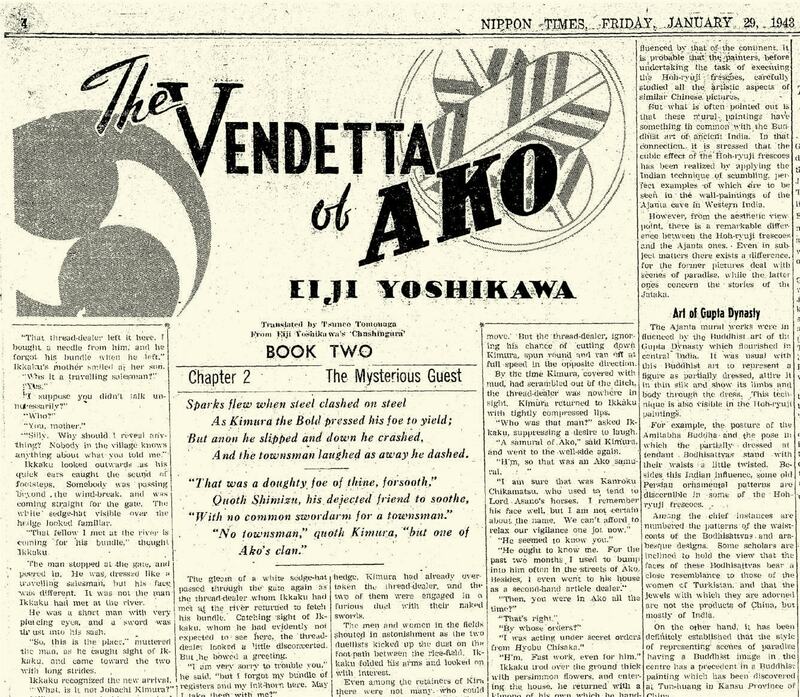 However, it was recently discovered that The Japan Times carried a series of the English translation of“Shinpen Chushingura”by Yoshikawa, titled“The Vendetta of Ako,”between 1942 and 1943. The story was a fictional account of a real-life band of samurai who avenged the death of their master. The Japan Times will add some of the content from the original Japan Times, launched in 1865, to the Digital Archives. The publication is arguably one of the few remaining newspapers from that era that enables us to experience society at that point in time. 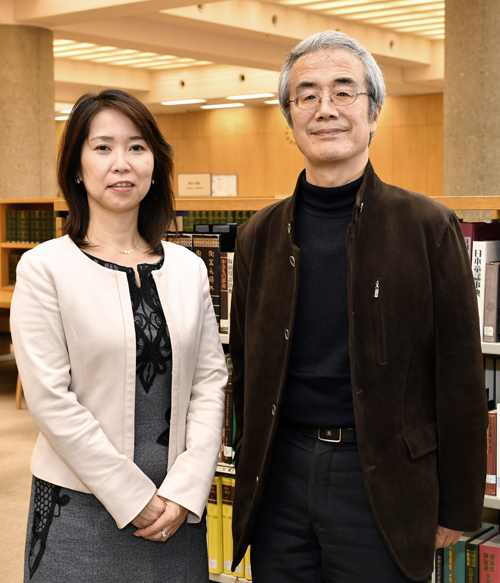 To mark the release of “The Japan Times of the 1860s,” Sayuri Daimon, managing editor of The Japan Times, interviewed Sophia University professor Yuga Suzuki, who specializes in the history of journalism, about the early paper’s value as a historical source and the characteristics of its contents. 1897 to 2017 We add one new year's worth of data every year. Free 30-day trial is available for potential purchasing and subscribing customers. We may change services and prices without notice. Users type date, edition and other key words and click "Search." A list of articles by year, month, date and page number appear on screen. Click on the article you want to read, and the page will appear. If you use a search word, articles containing the word is will be surrounded with red rectangles. 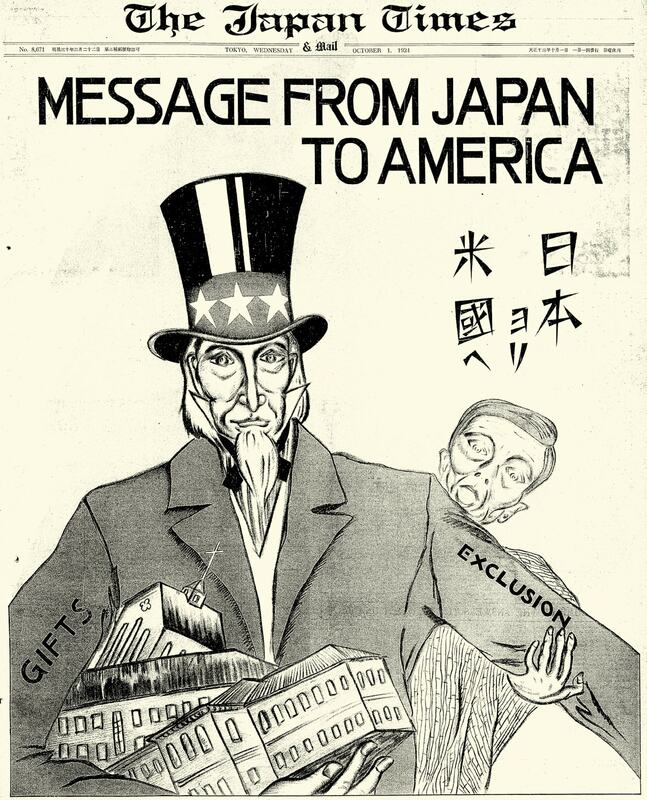 Access The Japan Times Archives with one of the following plans. Options 1 and 2 make multiple accesses impossible as they are installed with an IP address recognition function. Users can conduct keyword searches for content published through 2017. E.g.) Users who purchase JT1, JT2 and JT3 have up to three accesses.